Today Gina and the team will be showing off some sparkly projects using the gorgeous Gina K. Designs Foil-Mates™ and Fancy Foils. You will be thrilled with the shine of Gina's foils. And her Foil-Mates™ designs are delightful too. You won't believe how quickly your cards will come together once you start foiling. And by the way...it's quite addicting too. It is so very hard to photograph foil, but I hope you can tell just how shiny and sparkly my projects are. 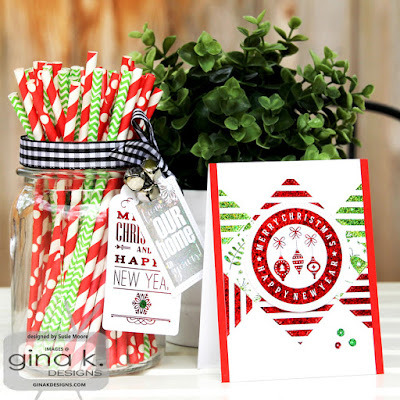 Don't forget that you could win a $25 Gina K. Designs gift certificate by visiting and commenting on each designer's post (links below) To see who won, check the Big News Forum at StampTV a few days after the hop. available at Gina K. Designs. Enjoy your day and I'll see you again tomorrow! Love your card! Thanks for sharing! Love these! Thanks for the inspiration! Beautiful card! Love your jar idea. Really fresh and fun projects!! Love those straws!! Love the card. Thanks for sharing with us and inspiring us. So pretty. Am Loving this "foil" thing! I really love the foil! I am confused about the straws were they just for decoration? I love the card. Love your foiled cards and tags. Very pretty. Your photographs are spectacular also. Beautiful card. I like the geometric design. Very creative. These projects are just so pretty. I love this foiled blog hop with all the great inspiration. Thanks for sharing. Like how you used multiple different foil designs on the one card. They ARE shiny and sparkle! Using those holiday foils make everything POP! 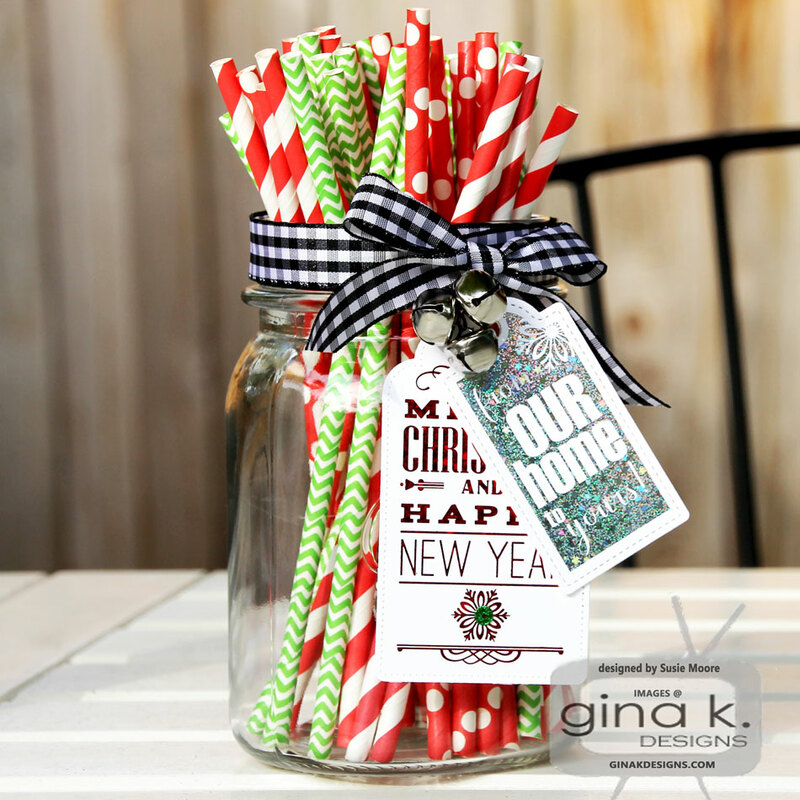 Mary, the jar of Christmas straws is a hostess gift. What a cute idea for the hostess gift and how pretty....lovely card too! I love how you used different foil designs for the 4 squares. I would have never thought of that. So unique and just awesome! those foil tags are just the way to add a classy element to any homemade gifts. Both of your projects are great. I'd love to know how you did your card. It is fantastic. Foil mates make all your projects sparkle and shine. I love your ideas using them. SO pretty! Love the foiling. I love how you did your card Susie. It is spectacular. Cute hostess gift idea and festive card design. Love the triangles with the stripes. Thank you for your inspiration and sharing with us all. Happy Holidays to you and yours. Very unique card. I love it. Love your hostess gift and card, beautiful! Love your hostess gift/tags. And your card is beautiful. Love love love! Thanks for the jar idea!! Such a lovely card the diamond shapes really do it justice. Simply beautiful! I need to get going and make some tags! Very nice card and tag presentation. The straws matching your color scheme is a very creative touch. Thanks for sharing and inspiring. Love how you combined colors in one card. The straws in the jar make a clever gift and the tags are very special. I love the "treat" jar. I am definitely going to use that idea. Thanks. Love your projects! The card is stunning. Great job! Wow! Love this technique! Beautiful cards and tags! Your card is fabulous! I really like how you used small foiled pieces to piece together the background. Cute as can be....I love how the straws add some Christmas deco without going overboard..the tag is wonderful!